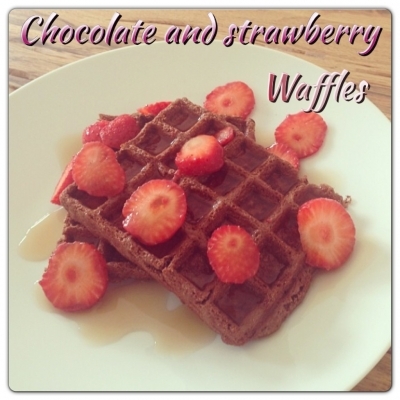 Delicious and healthy waffles to start your day or to enjoy post workout! Heat your waffle maker and coat it with coconut oil or butter spray. Slice and set aside 30 grams of strawberries to top your waffles once they will be ready. Blend all remaining ingredients (included the 10 grams of remaining strawberries) until you get a thick consistency. Add 1 or 2 packets of Truvia depending on your sweetness preference. If the batter is too thick you can add 1 tbsp of almond milk. Pour onto your waffle maker and cook for 2/3 minutes. Top off with the sliced strawberries and some maple syrup, honey or even chocolate chips and enjoy!